Ahoy Treasure Bead Mateys! Treasure Life is proud to introduce Kaelan Lockert, our first feature Treasure Hunter! Kaelan was born January 30, 2011 a happy and healthy little boy. At 3 months of age he was diagnosed with what was thought to be a heart murmur. It turned out to be much more complicated and on April 11, 2013 Kaelan underwent his first open heart surgery at the Stollery Children’s Hospital. During his first 2 years Kaelan had numerous tests and procedures in order to diagnose and receive treatment for his Cardiac condition. Kaelan and his family recently attended the Children’s Heart Society Campout on the May long weekend. They were able to set all of the medical stuff aside and enjoy a fun filled weekend with families that were going through similar issues. It was here that his Treasure Life Bead Journey began. He was given his colored cord with a Treasure Life Anchor Pin, a Child Life bead and the beads for his name. From there with the help of his parents he strung beads each representing a different procedure. 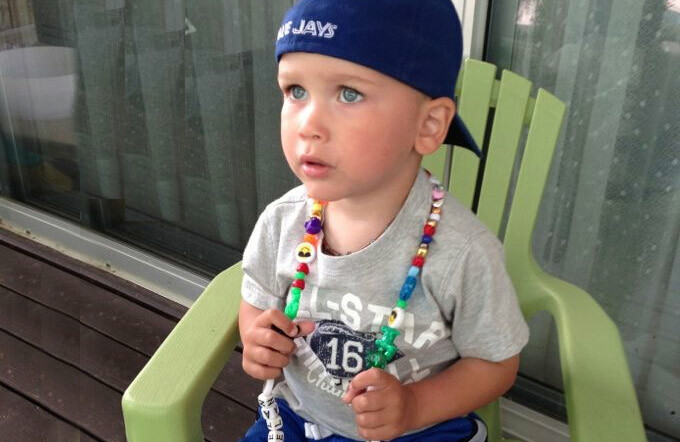 While Kaelan’s journey is a tough and scary one the beads provide a way for Kaelan to explain his journey to others as he talks about each bead on his journey chain….and put some happy flutters in his heart!